Ably edited by Mary A. Giunta (an historian with the National Historical Publications and Records Commission), A Civil War Soldier Of Christ And Country: The Selected Correspondence Of John Rodgers Meigs, 1859-64 is a collection of personal and official letters and original documents that provide the reader with a "window" into the doomed life of a young Union officer. Laid out in complete candor is the story of John Rodgers Meigs and his relationship to family and friends, as well as his experiences as a cadet at West Point (including a meeting with Abraham Lincoln), and his life as a combatant in the Civil War. The son of a Union Quartermaster General, John Meigs official correspondence reveals what his duties were like as a military engineer and aide-de-camp to Union generals. The young soldier was to ultimately meet his death in the war (a vivid account was provided in a post-war exchange of eye-witness statements) but his memory is preserved with an impeccable scholarship within the pages of A Civil War Soldier Of Christ And Country. 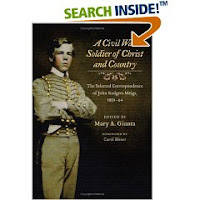 A model work of historical import, enhanced with the inclusion of a glossary of names, places, and phrases, as well as a selected bibliography and an index, A Civil War Soldier Of Christ And Country is a welcome and invaluable contribution to the growing library of Civil War memoirs, biographies, and histories.